Join us for Late Night! 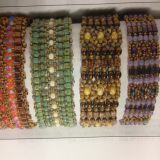 Every second and fourth Wednesday night from 6-8pm, come in and bead, chat, snack and shop with friends! Late Night is free to attend, just call ahead to let us know you'll be coming. See you there! 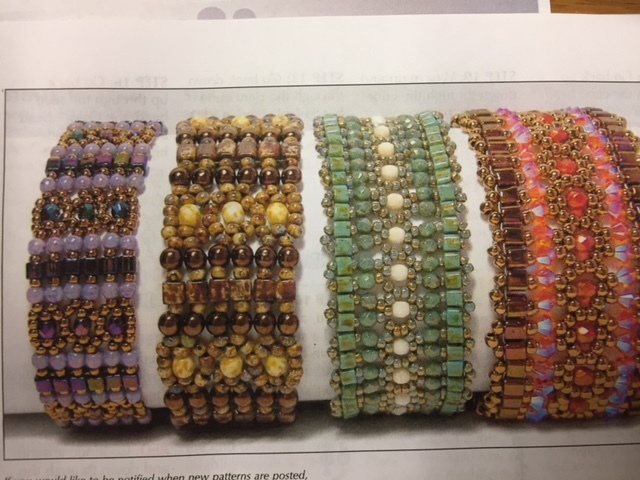 Learn to design and make your own necklace or bracelet. This class will introduce you to all the different types of stringing materials and tools as well as how to attach a clasp. 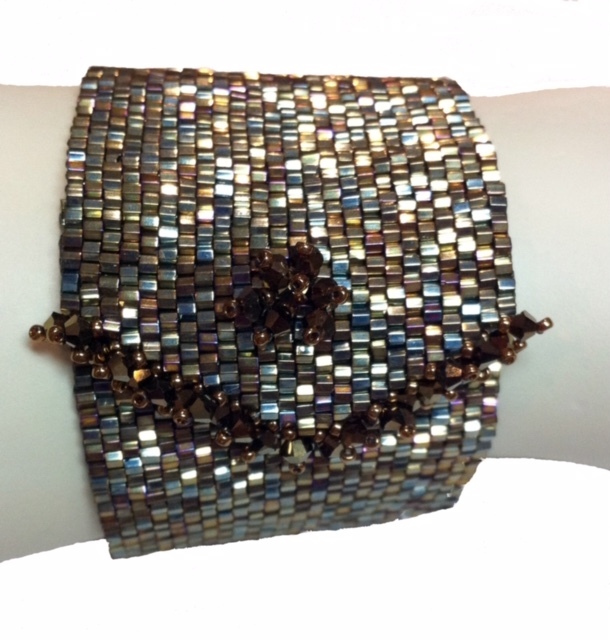 You will design and make one bracelet in the class using semi precious stones. Absolutely no experience necessary. Instructors: Staff. 2 hours; $40(includes all materials. Knotting not only protects delicate beads, but the knots can be used as a design element; knotting with leather is especially popular today. 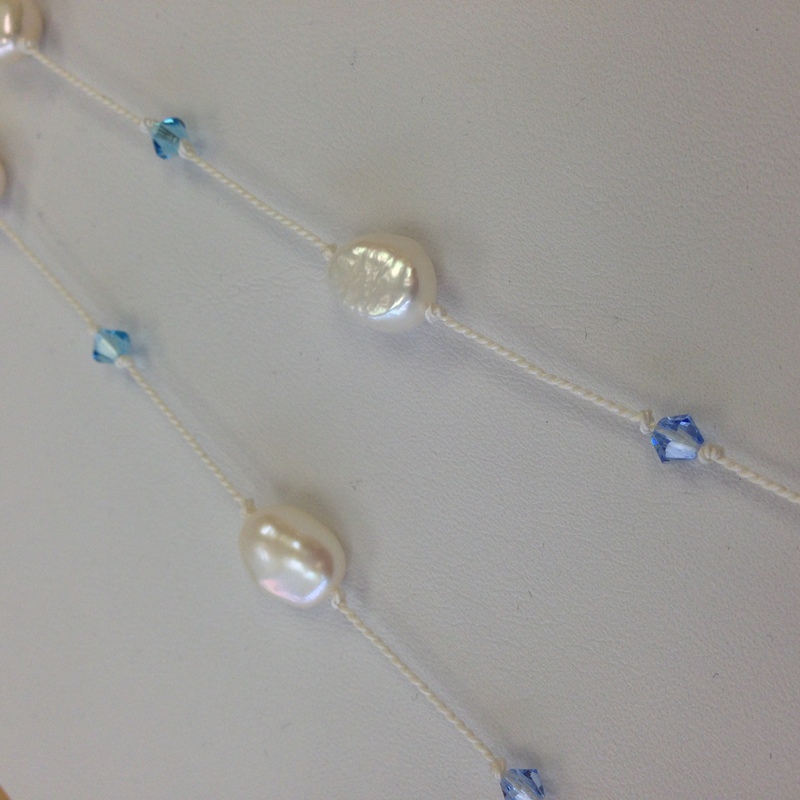 In this class you will make a 'tin cup' style necklace with large fresh water pearls, Swarovski bicones, and a sterling silver clasp. Basic stringing/crimping knowledge required. Instructors: Staff. 2 hours; $45(includes all materials). 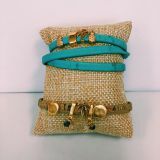 Join us for this free workshop to learn how to make this easy bracelet to add to your arm candy. 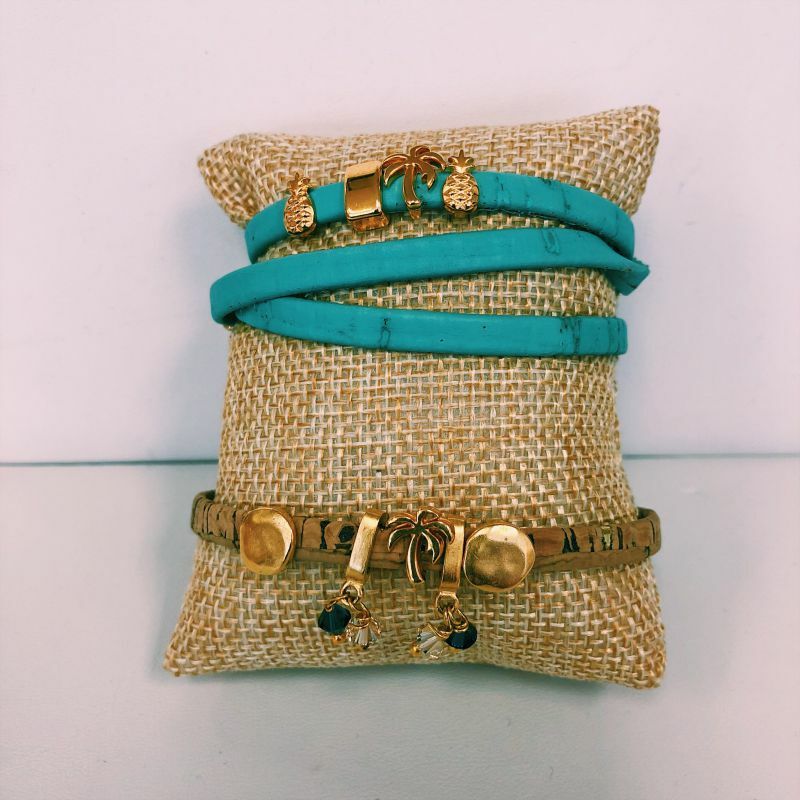 Summer-ready colors, findings and glue combine to create this quick and easy project, also perfect for gifting! 20 mins. Materials not included. Another great design by Jill Wiseman! Similar to the Festival of Lights, this bracelet can also be worked as a bangle or with a clasp. Using a variety of shaped beads the color possibilities are endless! Appropriate for all skill levels. Please allow 2-3 hours to complete. $35 plus materials. Curious about gemstones? Come spend an hour with our staff gemologist as we explain the basics of Gemology. 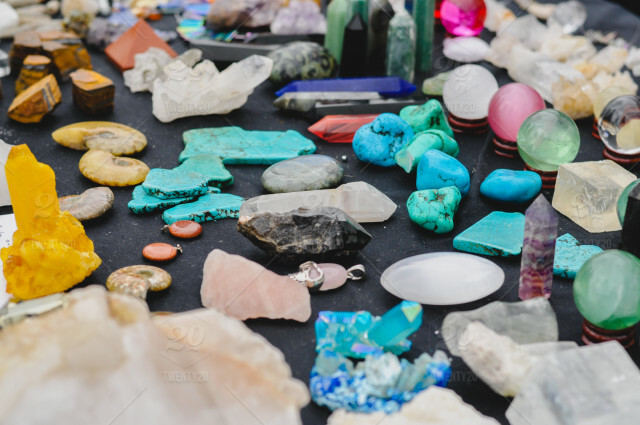 We'll discuss crystal structure, how light affects stones, gemstone names and interesting facts about stones. 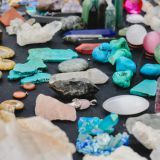 Plus, see & touch all kinds of interesting gem and mineral specimens! Taught by Debbie Daum. FREE! Talk about bling! This will catch someone's eye from across the room. You will use approximately 165 4mm crystals in the main color, and 120 in the second color. A seedbead base supports the crystals. 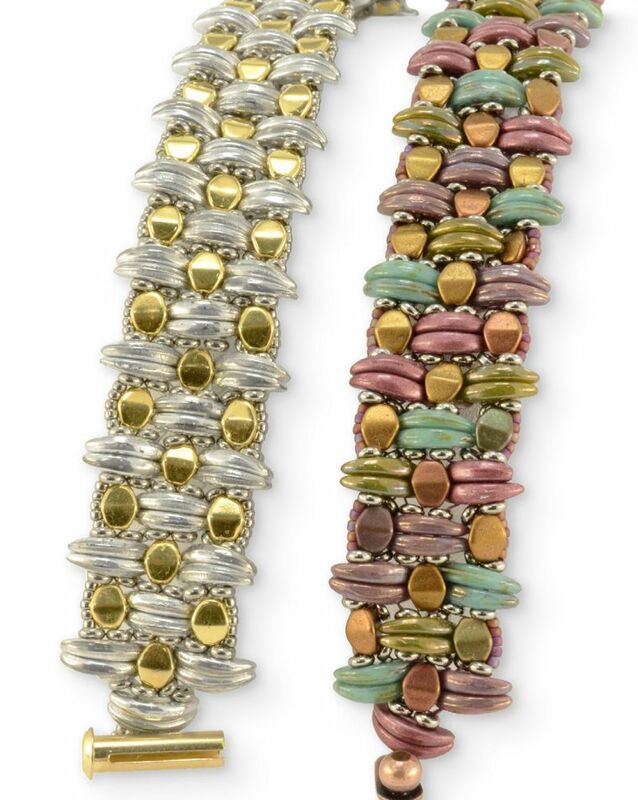 Finish it off with a 3-strand magnetic tubular clasp in sterling or gold. Prerequisite: some netting knowledge. You may not finish the bracelet in class, but you'll have all the information to finish it at home. 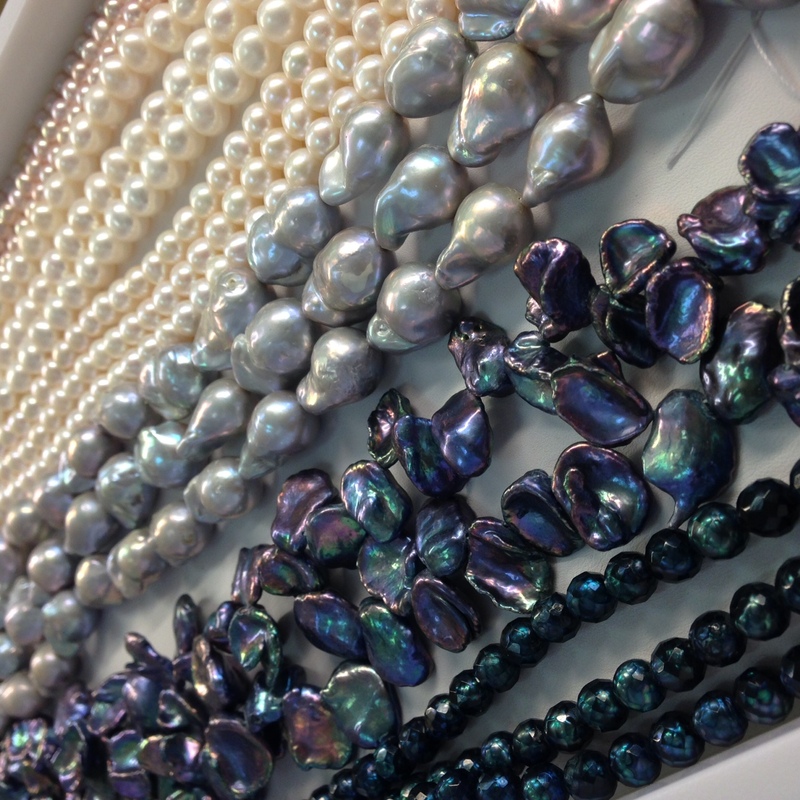 Please arrive 15 minutes early to select your beads; class will begin promptly at the appointed time. Instructor: Pat Riesner. $60 (plus materials) 3-4 hours. You won't be able to resist this bead - it shines and sparkles like no other. 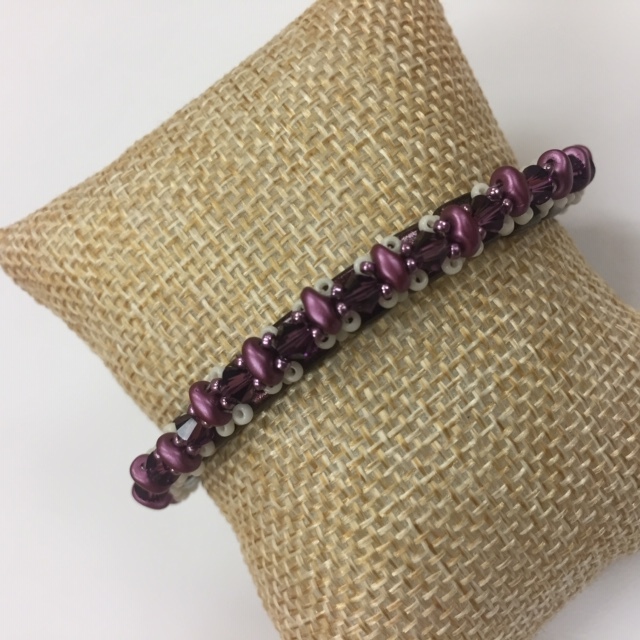 Made with 10/0 hex cut delicas and 3mm crystals, it's a perfect combination for fall, but we have other colors as well, good for year round! 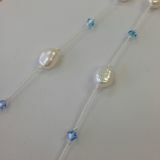 It closes easily along a tapered edge with elegant Swarovski crystals. 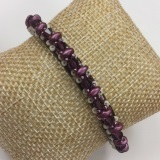 You won't finish this bracelet in class, but you will complete the tapered edge and crystal. PREREQUISITE: proficient in peyote stitch. Instructor: Pat Riesner. Approx.3-4 hours $60 plus materials. 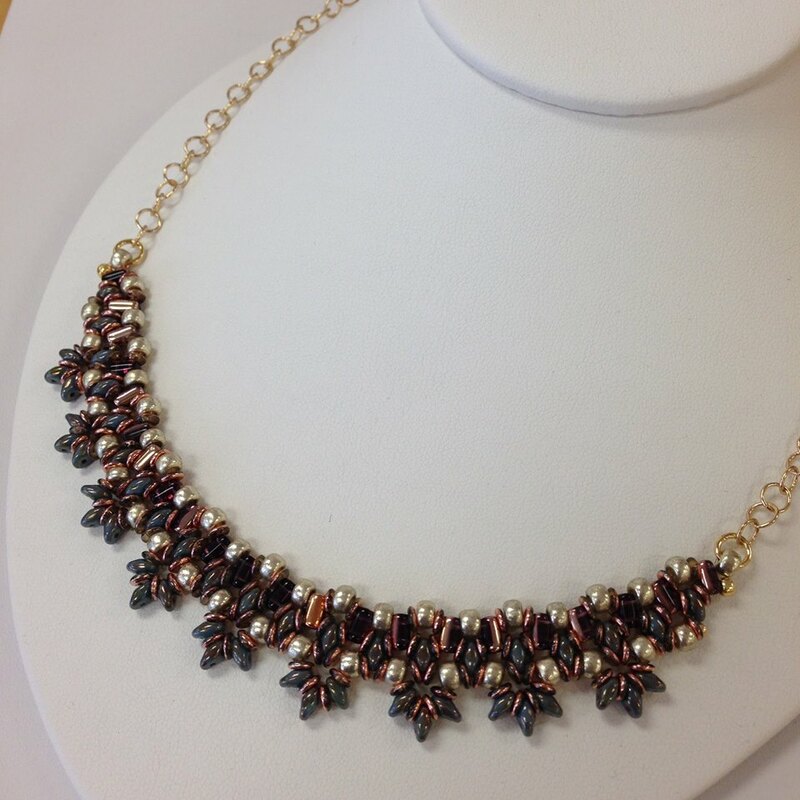 This gorgeous necklace is made using size 6 seed beads, O beads, Superduo's, and Rulla's that fit perfectly together for a delicate statement. 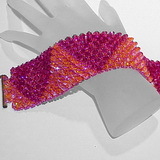 A great introductory project if you would like to experiment with different shaped seed beads. Instructor: Staff. Two hours. $35 (plus materials). 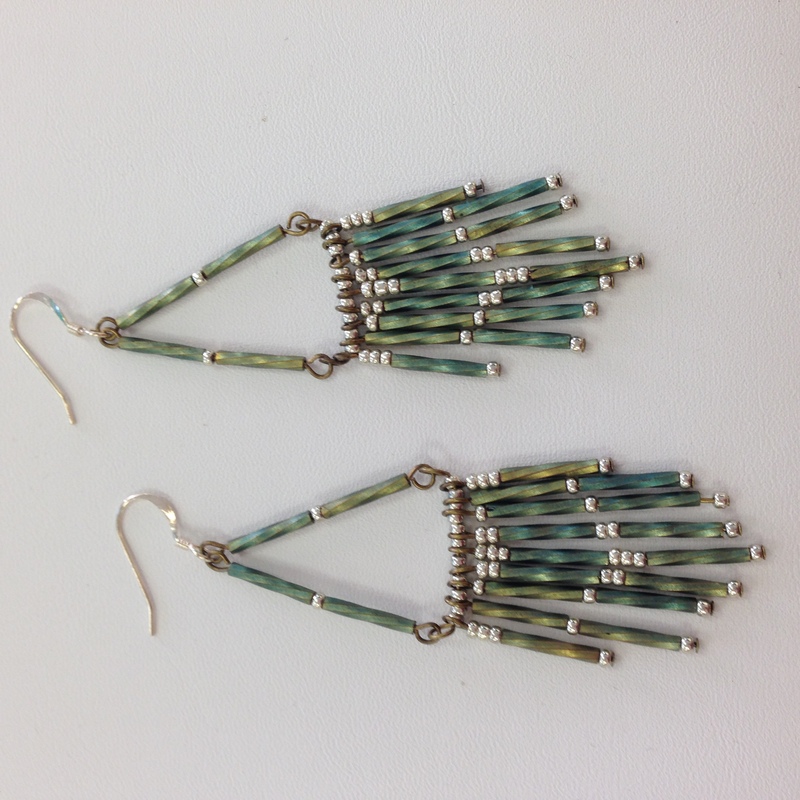 Perfect your simple loop technique while making these bohemian, funky earrings. Use 12mm bugle beads, size 11 seed beads and head pins to create this piece. Instructor: Staff. 1 & 1/2 hours. 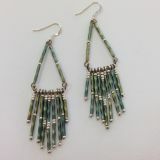 $35.00 (includes seed beads and head pins). 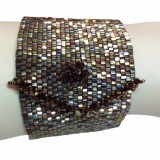 Create a soft tapestry bracelet with this adaptation of a Deb Roberti pattern. 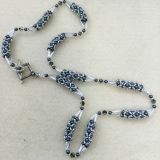 Using cubes, seed beads and round or firepolished beads this pattern easily adapts to use a range of different beads for many stylish looks. Instructor: Staff. 2 hours. $35 plus materials. 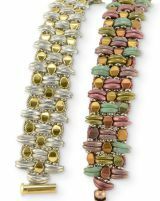 Crescent beads and pinch beads create the look of a woven tapestry. Demi rounds complete the textured look. Another beautiful design by TrendSetter artist Carole Ohl. Taught by Marianne Olbermann. 2-3hrs. Materials not included. $55. 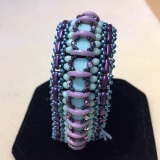 This lovely cuff is a 2-hole beadlover's dream. The crescents rise like mini moons over the base beads, giving added depth to the bracelet. 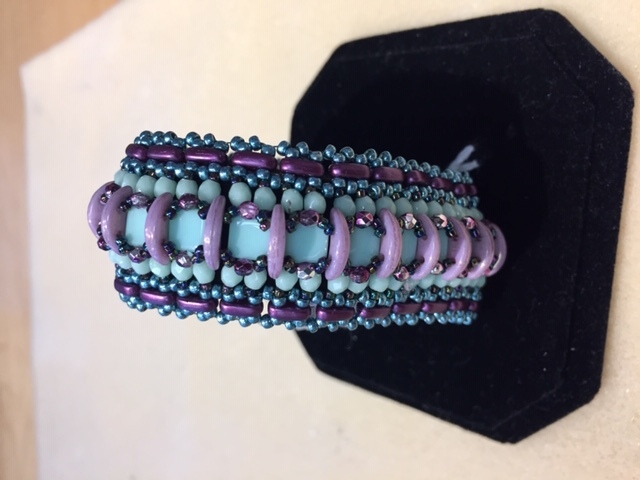 We are fortunate that the designer Marcia Balonis has given us permission to teach this former Bead & Button Show project. Taught by Marianne Olbermann. Approx. 3 hours. $60 plus materials. This is an elegant necklace made with beaded beads of pearls and seed beads, connected together with bugles and bicones for a stunning Deco look. Designed by Susan Sassoon, taught with permission. Level: Advanced Beginner. Instructor: Sandra Dellano. Approx. 4 hours. $55 plus materials. Kieu Pham Gray is coming! 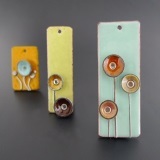 Learn enameling and cold connections in one class. 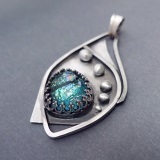 You will learn to torch fire enamel on copper and use transparent enamels on silver to create true colors. After firing all the pieces, you will rivet them together. Students will finish at least one pendant. Beginner level. 3 hours, must be at least 18 years old. Taught by the illustrious Kieu Pham Gray! Class fee:$75, Materials fee (kit) $40. Kieu Pham Gray is coming! 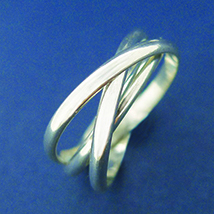 Learn to solder interlocking rings to create this classic ring design. 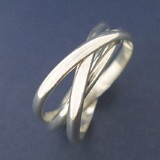 Students will have the choice of making a mixed metal ring or all sterling silver ring. Students who work quickly may have time to make 2 rings. Additional tools may be purchased from the instructor. Taught by the famous Kieu Pham Gray! Beginner level, 3 hours. Must be at least 18 years old. Class fee:$75, materials fee: $30. Kieu Pham Gray is coming! Create delicate works of art with filligree. 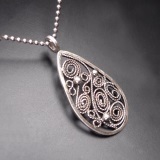 We will bend, twist and turn sterling silver stock to create an intricate pendant. Students will be challenged to put their creativity to action while continuing to fine tune your skills. Pre-requisite: must have some soldering experience and experince wirh wire working. Intermediate level, 4 hours. Taught by the famed Kieu Pham Gray! Must be at least 18 years old. Class fee:$90, materials fee:$75. Kieu Pham Gray is coming! Create a setting fit for royalty. This introductory stone setting class will add another dimension to your glasswork or any stone. 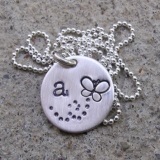 Students will have the opportunity to customize a pendant design to thier liking. (Dichro cabachons will vary). Additional tools and materials may be purchased from the instructor. Pre-requisite: must know how to solder with sterling silver. Intermediate level, 4 hours. Taught by the illustrious Kieu Pham Gray! Must be at least 18 years old. Class fee:$90, materials fee:$65. Kieu Pham Gray is coming! 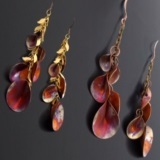 Turn simple copper discs into beautifully formed petals to make a pair of earrings or pendant. Learn to form the petals and patina them with a torch. Additional materials and tools may be purchased from the instructor. Beginner level, 3 hours, must be at least 16 years old. Taught by the indomitable Kieu Pham Gray! Class fee:$75, materials fee:$35 (includes kit & chain supplied by store). To register for any class, you must call to pre-pay and check availability: 914-644-8191. We don't take reservations via email or from the website because the attendance books are kept at the front desk, and only prepaid reservations are recorded. So please telephone during store hours to sign up for any class. Advanced registration and full deposit are required for any class. Space is limited and reservations will not be held without payment in full. Anyone 14 years of age or older may register for a class. No refunds or transfers for no-shows or for cancellations made less than 3 days in advance of your class. We reserve the right to cancel any class, in which case we will issue full refunds. Use of tools is included. We reserve the right to substitute comparable beads and components in class project kits based on availability of materials. Materials for classes will always be available for purchase on the day of the class. 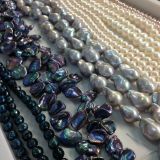 When attending a class with us, we kindly request that you support our shop by not using beads purchased elsewhere.